After you hang your wallpaper, you need to trim it to add a professional look to those awkward spots around the edges. Trim the wallpaper allowance at the ceiling and baseboard by using a breakaway razor knife guided by a metal straightedge, such as a taping knife or painter’s trim guide. Change blades often to ensure that you’re using only the sharpest blade, or you may tear the paper. Alternatively, you can crease the paper at the ceiling-wall corner, peel it back to cut along the crease with shears and then smooth it back onto the wall. If your walls are drywall, paper reinforcing tape and joint compound cover this ceiling-wall joint. Use just enough pressure to cut the wallcovering in a single pass but not enough to cut into the drywall or the paper tape. Oddly enough, the sharper your knife is, the easier this will be. 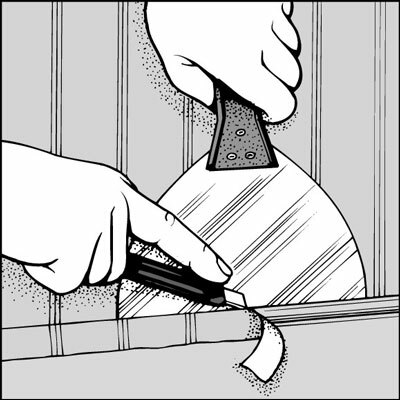 Trim the allowance by using just enough pressure to cut through the wallpaper cleanly in a single stroke. Before you move on to the next drop, remove any adhesive from the face of the wallcovering with a damp sponge. Wiping up wet paste is easier than getting it off after it dries. Also, wipe adhesive off the ceiling, baseboard, and other trim.